Island View offers complete peace and seclusion, and is set at the end of a private drive, within the residential area of Carbis Bay. A short walk from the historical St. Ives and the large and beautiful sands of Carbis Bay. Comfort is evident in every room following its recent renovation; the kitchen is superbly equipped, whilst all bedrooms have their own plasma TVs. The lounge has a large, leather corner suite with adjustable headrests, two additional armchairs, and a remote controlled 'plasma' electric fire. Full relaxation is available through the LG Smart 4k 50" TV (allowing you to play your holiday video and snaps) whilst also having access to Wi-Fi for you to connect to your won entertainment accounts (Netflix, Apple, Amazon etc), a blu-ray DVD player and a high quality Canton surround sound audio system with bluetooth access for you to have full access to your own music library. The lounge and kitchen French doors lead to the south-facing rear garden with total privacy. The raised decking area takes full advantage of the garden's sun trap with an 8-seater garden table and chairs. Sun loungers and sun chairs add to this comfort and relaxation. From Easter 2019 onward a children's playhouse and a BBQ hut, as well as a standalone BBQ, will be added. Upstairs has a master and twin bedroom, with each having a Velux window with blackout blinds. The master has a king-size bed with a luxurious damask fabric, Miracoil reactive springs to give you tailored comfort and support, and breathable Siletnight EcoComfort fibres to keep you cooler. Allergy UK approved PUROTEX ensures a Hypoallergenic and dust mite resistant sleeping environment making it ideal for asthma and allergy sufferers. The king size bed also has 4 drawers providing ample storage in addition to the drawers in the bedside tables, and the built in wardrobe. The master bedroom's roll-top bath and wc and basin cubicle, as well as full-length mirror and Remington hairdryer complete its comfort. The adjacent twin bedroom has 2 single beds and a full en-suite, with shower, basin and wc. The downstairs master bedroom enjoys the same king size bed as the upstairs master, has a wall mirror with drawers under, bedside tables and drawers, built in wardrobe and also a Remington hairdryer. The other downstairs twin bedroom has a standalone wardrobe, a chest of drawers and bedside tables with drawers. Both the downstairs bedrooms share the main bathroom which has a full size bath, shower over, wc and basin/mirror. Carbis Bay is an excellent location being so close to St. Ives which can be accessed on foot or even with a 3 minute train (5 minutes from the house), yet it has its own, glorious beach, very close to the house. Restaurants and bars walking distance from the house or a short trip to St. Ives. In staying at Island View you would also have the benefit of ample, private parking without having to drive into St. Ives which can on occasion be very busy for cars. The house itself is also very close to the Carbis Bay Hotel and so for those enjoying events there, Island View would offer an ideal base, in addition to the other advantages of the area. Large leather corner group with adjustable headrest, 2 armchairs, LG smart 50" TV, Philips blue-ray DVD, Canton surround sound audio with bluetooth connectivity, remote control 'plasma' electric fire. Full set of plates, side plates, cereal bowls, soup bowls, glassware, stainless steel pots and pans. Additional crockery and cutlery. Tefal steamer provided too. Rangemaster electric oven with grill, gas hob with chimney hood over. Integrated washer/drier, dishwasher and fridge freezer. Microwave and toaster. Dining table with chairs, high chair. Cutlery and crockery. West Cornwall Golf Club, Lelant 1.5 miles (18 hole links course). Tregenna Castle, St. Ives 0.5 miles (14 hole sub-tropical parkland). Notes on accommodation: Island View lies as the last house at the end of a private drive and has complete seclusion. As such, it is completely suitable for children. To the front of the house is a large open area for parking, as well as a separate drive, and so parking for several cars is possible. Steps to the front door, the rear garden is level with the French doors to the kitchen/dining area. Kitchen and lounge facilities as described above, wireless broadband and digital TV also provided. Prices include all gas and electricity usage. Full gas CH. Stair gate. Regret no smoking or pets. Outside: Two decking areas within the secluded south facing rear garden sun trap, and extensive trees and shrubbery. Garden table with accompanying chairs and bench, sun loungers. External lighting, barbecue and shed for storage. Further patio area adjacent to the French doors to the lounge for those who wish to relax in the shade. Cleaning / Towels / Linen / Maid service: Duvets and linen provided. Weekly maid service, all wash facilities available within house if required. Outside the house has potential We didn’t use this area due to the time of the year It is a little overgrown in places and the decking slippy. Although a note was left for us on the door to say please be careful if going outside. This did not effect our stay at all. Richard and Nicky left us a welcome note along with a bottle of Prosecco wishing Happy New Year. So kind! The only pro is the location of the house. The condition of the house however was terrible. Nothing like the pictures. I spent 2 days trying to clean it to a minimum standard. Very run down inside. Mould on tablecloth. Leftover food caked on placemats. Dining room chairs filthy and rusted. Oven grill pans & pots all needed to be washed before use. A film of dust covered all the furniture. Dead flies were stuck on the wall. Walls & carpets were very dirty. Cupboards especially in the kitchen was very dirty. Bathrooms tiles and floor sticky and dirty. Bins rusted. Not enough seating in the lounge for 8 people. Windows were filthy didnt seem as if it was washed for the last year or more. The garden was overgrown and so unkempt. Lots of weeds etc. Patio was grubby and so slippery/dangerous when wet. Don't be fooled nothing like the pictures. Couldn't sit outside and enjoy evenings. Complained to the owner from Day 1 but he only acknowledged and apologised nothing else was done. I really believe that the price advertised is just too much for what you get. In fact The pictures on home away is a gross misreprentation of what the house really is. I have pictures of everything that back up my review. Happy to post these. I will definitely visit Carbis Bay again but will not rent this property again. Pros: the location of the house in Carbis Bay is a brilliant central location with a fantastic beach just down the hill. The house is also large and spacious with plenty room for 2 families with comfy beds and plenty storage, lots of room outside for several cars unfortunately that’s where the pros end! Cons, the house has pretty much been done up a number of years ago and then not maintained. Its damp with mold and peeling paint and plaster in the kitchen area and the guttering is leaking badly on the ouside making the wall wet where the electrical box was located. The house was downright filthy when we arrived and although the beds were clean and made up that was all. The surfaces, floors, switches, door handles, sofa and cushion covers were disgustingly dirty. The windows hadn't been cleaned in what seemed like years and the outside garden and drive were a complete mess of 6 foot weeds. Although there was a picnic table to sit out on the decking to get to it was mossy and super slippy despite the weather being dry. There was no enjoyment to sit in the outside area looking at all the weeds and filth! The shed that’s described as for your use for body boards etc is completely filled with broken items and discarded paint pots, brushes and paint trays the door had also fallen off meaning you couldn’t even shut it off to stop children going near it. There was a serious plumbing problem going on under the kitchen sink that was seriously disgusting when the cupboard was opened. All these issues were put to the owner soon after arrival of our 13 night stay. He was apologetic but nothing was done other than getting the wheely bin emptied. At 8pm the night before we finished our holiday a car appeared in the drive and the couple were the gardener and the cleaner, they seemed to have just come for a visit as it was clear that they weren’t there to do anything and our holiday was over at that point anyway. So overall it was a good base but we didn’t want to spend anytime in the house and we were really disappointed to travel 600 miles in good faith according to the description and photographs and not find what we had hoped for! We will definitely be returning to the area but won’t be returning to this accommodation unfortunately. Not as advertised, a huge disappointment. Would not recommend. The description of this holiday home is very misleading and contains many misrepresentations. It is neglected and much maintenance is required. Bedrooms: comfortable with good quality bed linen. 2 exceptions, the upstairs shower room ceiling paint had peeled away. The downstairs twin room was damp and musty. The baby gate could not be securely fixed, a potential hazard. The Kitchen/Diner: the freezer was iced up solid and required disconnection and defrosting in order restore to operational use. The 6 dining chairs were in poor condition, needed cleaning, one with rusty frame. The pads of the fold away chairs were ripped. The printed table mats surfaces were worn away. Insufficient cutlery, the mismatch everyday tableware required using the dishwasher more often as the Royal Doulton china considered unsuitable, a breakage risk and not for microwave use. Only 3 wine glasses! The badly pitted non-stick cookware all had to be cleaned before use. The kick board below the sink cupboard unit was detached. No draining board or trays provided. The grill accessory for the microwave was missing. Wires hung down from where there had previously been under cabinet lights. Pat test requirement had not been done on most electrical items e.g. microwave, 27.05.11, cooker hood 01.04.2013, no evidence of an annual gas safety check or public liability. Re-cycling: There were no re-cycling containers supplied for the second week of our stay and we had to visit the local recycling centre. Sitting room: The seating unit is worn, inadequate for a potential 8 guests. The bean bag could not be classed as seating and was soiled. The electric fire did not work. The central heating worked well once we sought the owner's advice. Outdoor: There is no gas barbecue, sun umbrella or sun loungers as stated and pictured. The washing line had no prop or pegs. The garden shed was not secured and contained many used paint containers, old decorating items which were potentially hazardous to my 3 year old son. The garden is a wilderness, full of weeds, one gets the impression the grounds have never been attended to since the house first featured on the website. The only saving grace was the proximity to Carbis Bay. Spacious house, fantastic location was a perfect holiday! 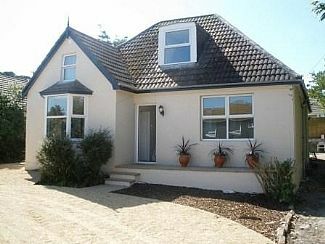 Situated at the end of a no through lane, just uphill from Carbis Bay. Spacious house great for my family, my parents and friends. Beds were so comfy with new bedding, quilts & pillows. Heating was brill & needed as was a particularly chilly week. Large spacious kitchen was great for all.of us. We also took 4 toy breed dogs with us via pre arrangement. Perfect for dogs with the wooden floors and wrap around garden. Found dog friendly beaches in Hayle, Porthkidney and Gwithian. Gwithian beach particular nice with parking at the top, toilets and beautiful turquoise sea and rock pools. We visited Lands End, roughly 20 mins drive. St Ives very close, we found a taxi ride was easier than the local train as a couple were cancelled then another was 2 full 2 allow us on. Taxi was quick and cheap, much easier. Great home cooking cafe in Hayle, Duckies Cafe dog friendly 2! Had a great Easter holiday, weather wasn't the best but house and location defiantly made up for that! The house is large and spacious, with great parking for multiple cars if needed. Richard is very accommodating, and graciously supplied us towels as we had come from Canada. It was clean and tidy, but both inside and out could use some TLC. Porthmeor, St. Ives, a large wide sandy beach on the Western side of St Ives. There are facilities close to the beach including the St Ives Tate Gallery. Porth Kidney Sands, Lelant, a deceptively large stretch of white sand with a huge expanse of sand at low tide. There are extensive dunes. Nearest airport - Newquay Airport 38 miles. Plymouth City Airport 74 miles - offers flights to London Gatwick. Plymouth Channel Port 74 miles away. Nearest train station - Carbis Bay 0.5 mile - small carriage train service to local stations including St Ives (3 mins away) and links with St Erth (5 mins) for direct service to Bath, Bristol, Reading and London Paddington. Frequent local bus services within short walking distance. Car recommended if exploring depths of Cornwall and Devon. St. Ives 2 miles away, local supermarket walking distance, larger supermarket 1 mile. The locally renowned fish and chips shop within 1 mile! Numerous pubs in and around Carbis Bay and St. Ives. Tate Modern within St. Ives, 2 miles. Land's End 18 miles. Eden Project 34 miles. Penzance (Helipad for flights to Isle of Scilly) 8 miles. Porthcurno, Minack Theatre (Cornwall's Theatre Under the Stars) 18 miles. Carbis Bay is a true treasure, with its outstanding and glorious beach on the doorstep of Island View, and lying a short distance from the historic St. Ives with its cobbled streets and several pubs and restaurants. Island View is ideal for those looking for complete peace and tranquility with its range of luxurious features, as well as a base for those wishing to take advantage of St Ives and the wider reaches of Cornwall and Devon, due to Carbis Bay's excellent transport links - not to mention the nearby coastal path to St. Ives. There are numerous places of interest and leisure activities, for which Devon and Cornwall is well famed, and the more local attractions have been mentioned above. Booking Notes: To book, please telephone Richard Rogers (number below). To confirm a booking within 4 weeks of the holiday date, the full balance is payable, if more than 4 weeks, 50% payable with the balance payable 4 weeks from the holiday date. Please note a fully refundable £250 breakages/damages deposit is payable with your balance payment Changeover Day: For weekly bookings departure by 10:00am on Saturday, arrival no earlier than 2:00pm on the Saturday. Otherwise by arrangement. Notes on prices: Prices are for the property per week in UK Pounds. Outside of peak periods (Summer, Christmas/New Year, and Easter) shorter breaks are possible at any time, subject to availability and a minimum 2 night stay. Rates will be 10% of the weekly rate per night for Sun-Thu stays, 25% of the weekly rate per night for Fri-Sat.